Beau Meyer takes viewers on a Pike Fishing expedition to a private ranch in the San Luis Valley. Stream fishing near South Fork, Colorado in July. 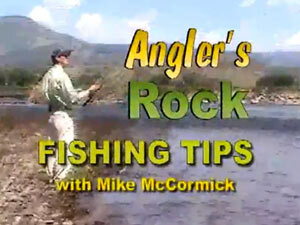 How-to/Demonstration video: Fishing upstream, casting every few feet, fly presentation, and catching brook trout. A how-to video on fly fishing in high mountain, heavy timber creeks. 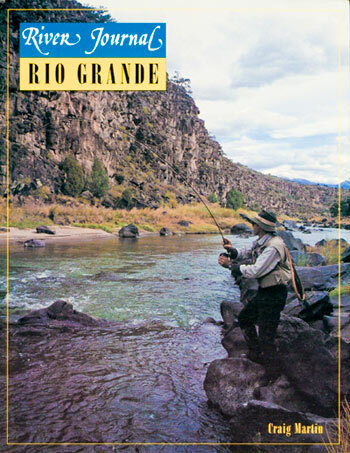 The 4UR Ranch is a premier Colorado fly-fishing ranch along the Rio Grande River. Named one of the "100 Top Fishing Destinations" in the world by "Wild on the Fly", the 4UR Ranch offers over 6 miles of private tailwater for fishing through-out it's 3000 acres. 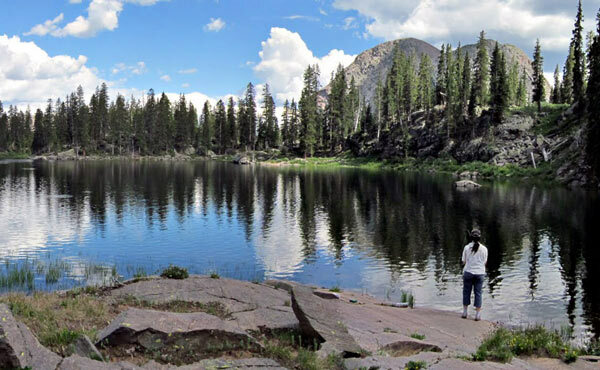 Perfect for the beginner or seasoned angler, we offer guided fishing and high alpine lake fishing as well. Flowing along the valley floor, Goose Creek (a tributary of the Rio Grande) is divided into 15 stations along it's banks. You're station is chosen by you through a lottery held at dinner the evening before. Video features a hike into a beautiful and remote trout filled creek (Colorful and wild Brookies, Rainbows, Cutbows, & Cutthroats) in the Weminuche wilderness near Creede CO. Great fly-fishing and hiking adventure near the Rio Grande River. 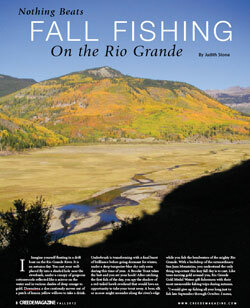 Trout Fishing the Rio Grande: "This is wild country, sparsely populated, punctuated by dense evergreen forests and stunning mountain vistas. Anglers can camp along the Rio Grande and expect to fish in solitude for as long as they stay..."
..."After leaving South Fork, the river takes on a bigger character as it travels towards Del Norte. The lack of public access, and higher water volume, make this a perfect section to float. The river is not crowded here - not many people float fish - and this is where the really big browns (and some rainbows) are, fed by lush bug habitat along this valley setting..."
"...this year's trip was special for a lot of different reasons, none the least of which was that I finally figured out the Browns on the Rio Grande...I had figured them out. 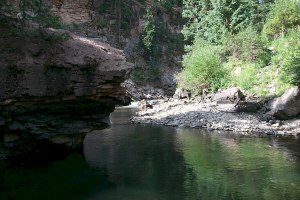 I could see them in the water, in the deeper pools, and I noticed that they were only surfacing in the shaded areas, near the rocks and overhanging trees. I also realized I had been fishing too light..."